Full Beam Master with queen bed, desk and settee, 1 Guest Double, 1 Guest Twin. All with Ensuite heads and showers with ample storage. Each stateroom is equipped with bathrobes and slippers, the bathrooms offer hairdryers and a complete range of L'Occitaine products. Full satellite internet service with 256k up and down, broadband, with compression about 450k. Simon has been sailing professionally since 1988. Prior to this he trained as a boat builder in South Hampton. 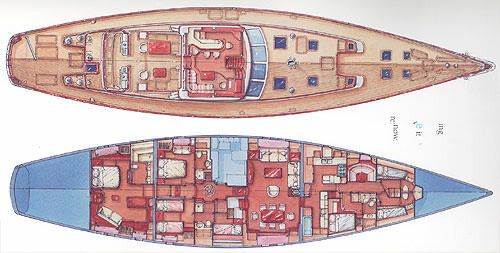 Super yachting has taken him all over the world, from Alaska to Cape Town, & the Pacific. He particularly enjoyed the Classic yacht racing, still embracing the old traditions of the sea onboard todayï¿½s modern yachts. Heï¿½s a friendly, outgoing person who enjoys cycling and a fit active lifestyle. I have been cooking within the Super yacht industry for around twenty years, on a variety of Motor and sailing yachts, cruising around the world. The majority of my boats have been Mediterranean based, so my cooking style reflects this, with strong accents on fresh, healthy ingredients, sourced locally where possible, intermingled with homemade delicious desserts, pastries and breads. Whilst between boats, I did a three-month stage at a Michelin starred restaurant in Winchester, UK, called the Back Rat. The style of food was fresh locally sourced ingredients for British cuisine, with a modern twist. With a friendly easy-going nature, I am passionate about good food, cooking what people love to eat and introducing them to new cuisines and flavors that reflect where the boat is cruising. I was born in the South of England, where I grew up not far from London. With regular visits to Europe for holidays from a young age. My love for food was definitely inspired from all the lovely markets and restaurants we ate in and visited. In my spare time I love to explore new places, keep fit, and read. I love live music and theatre. Andrews 72 since 2006. Over the past 25 years he has cruised, raced and delivered various sailing and motor vessels ranging from 12m ï¿½ 52m. He has sailed as far as the Eastern and Western Mediterranean and all through the Caribbean islands, as well as the French and Italian Rivieraï¿½s covering more than 75,000 miles. Prior to the yachting industry, he built one of the film and television industryï¿½s largest post-production facilities. His life style choice as a captain/engineer has allowed him to develop his love for sailing, exploring, entertaining and meeting new people from all over the world. Will greatly looks forward to doing his part as the engineer and providing guests the best possible experience aboard Whisper. Born in Argentina, Lucila(a.k.a. Lu) is very active and outgoing. When she was younger, her father built a boat that her and her family traveled on, opening up her love for exploration and travel. Since then, she has been all over the world and has sailed parts of South America & the Pacific, all of the Caribbean and Mediterranean. With a background in economics, she worked in the pharmaceutical industry doing sales and marketing. She has also been professionally competing and teaching kite surfing and water sports for many years. Lucia is the CEO of the Girls Kite Camp that promotes womenï¿½s involvement in kite surfing.